ON THIS DATE (May 5, 1989) ... Nolan Ryan faced Roger Clemens at Fenway Park, and another classic resulted. 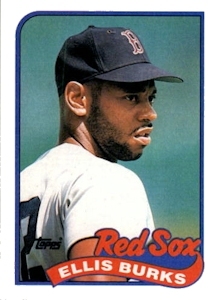 In some ways, last Sunday's game in Texas was just a setup for this one, a raucous, 7-6 Red Sox victory that included two home runs by Mike Greenwell, more close pitches from Ryan, a failed comeback by the Rangers and one of the purest paybacks in recent memory for Ellis Burks. There was a hotly disputed and pivotal call at second base and a wildly unsuccessful relief effort by Lee Smith. The biggest save of the season from Bob Stanley. And weather so bad the bases had to be changed late in the game. Also, this time the benches cleared. It happened in the seventh inning, when the Red Sox broke a 3-3 tie with a four-run rally. Last Sunday, Ryan had hit Burks in the shoulder blade and helmet, forcing the center fielder to leave in the first inning of the Texas fireballer's 2-1 win over Clemens; this time he threw a 2-2 fastball that buzzed past Burks' face. Burks pointed at Ryan, stepped forward and yelled. After a moment, he was grabbed from behind by catcher Geno Petralli, and the field slowly flooded with players streaming from the dugouts and bullpen while cameras flashed in the stands. When the dust cleared, Burks stepped back in the box, fouled off two pitches and broke the tie with a sharp single to left, his third hit of the game off Ryan. The hit chased Ryan (3-2), who, after striking out 11 last Sunday, struck out just three and allowed eight hits in 6 1/3 innings. Clemens (4-1) won the strikeout duel this time, fanning nine in seven innings and allowing just seven hits. Burks later scored on a wild pitch from Cecilio Guante. Nick Esasky added a two-run double. Greenwell, who hadn't homered in 15 games, hit a bases-empty shot off Ryan in the second and a two-run shot off Ryan that tied the game in the sixth. After the Sox' rally, the game dissolved into controlled mayhem. Clemens walked a batter and gave up a double to Ruben Sierra before leaving in the eighth, and the Rangers scored three with Smith in the game. Smith got one out. He gave up a two-run double to Julio Franco and a run-scoring single to Rick Leach. It was left to Stanley, who got his team-leading fourth save, to end the inning on a controversial play at second. Cecil Espy, who had three hits off Clemens, hit a slow grounder to shortstop Jody Reed. His shovel throw to Marty Barrett was close, but second base umpire Rich Garcia called out Jeff Stone on the force, touching off a heated argument with Rangers manager Bobby Valentine. Clemens had not given up a hit with a runner in scoring position in five starts when Rafael Palmeiro drove in two runs with two out and runners on first and second in the third inning. With one out, Steve Buechele hit a single up the middle. Espy followed with his second hit in two at-bats, a single to left on a forkball at his knees. Clemens struck out Scott Fletcher with a forkball in the dirt, but Palmeiro hit an apparent forkball into the left-field corner, scoring both runners and giving the Rangers a 2-1 lead. Bob Stanley threw four pitches in the ninth to end the game.